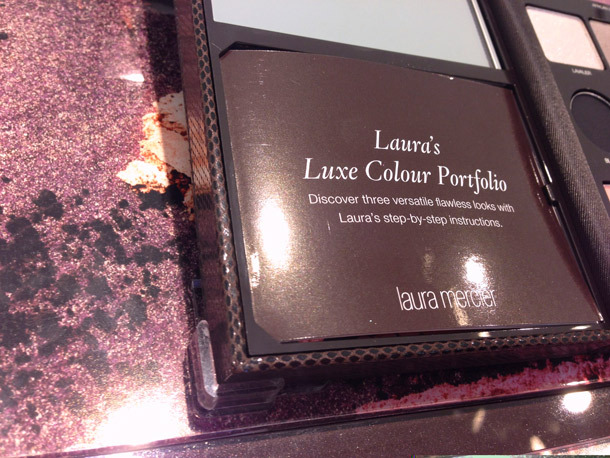 At Sephora I bumped into some new spring products from Laura Mercier, like the Luxe Colour Portfolio. 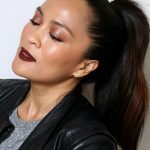 Laura’s palettes rarely let me down… I love how she puts her colors together, balancing wearable shades with fun twists here and there (like Bobbi Brown meets NARS). It’s elegant, but not too safe, and that’s one of the things I absolutely adore about her stuff. Especially her palettes. 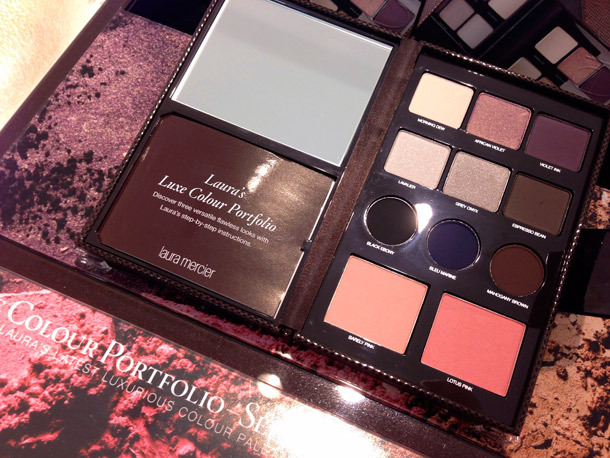 The $78 Luxe Colour Portfolio comes with six powder eyeshadows and three cake liners in a mix quiet grays and taupes punctuated by rich purples, browns and an indigo blue. 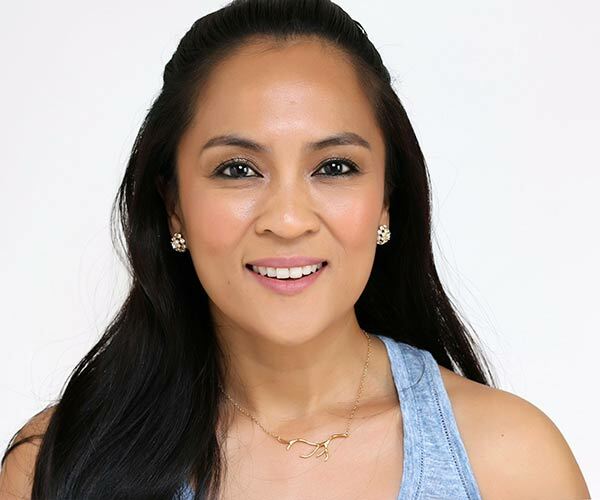 It also houses two pink powder blushes — one shimmer and one matte — for naturally flushed cheeks. 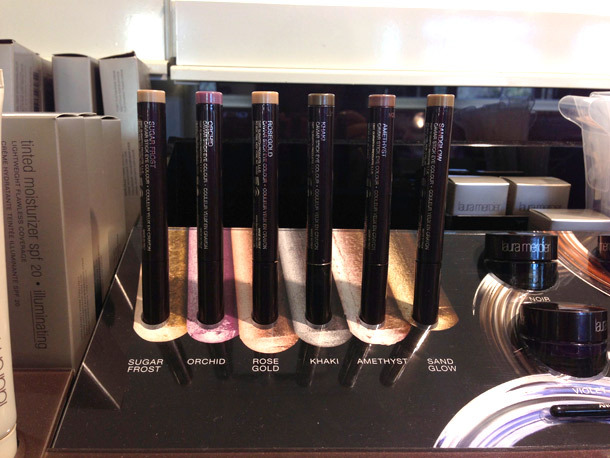 The pieces certainly feel luxe based on my time with them in the store, especially the shadows and blushes. Like satin sheets! And the pigments don’t hold anything back. 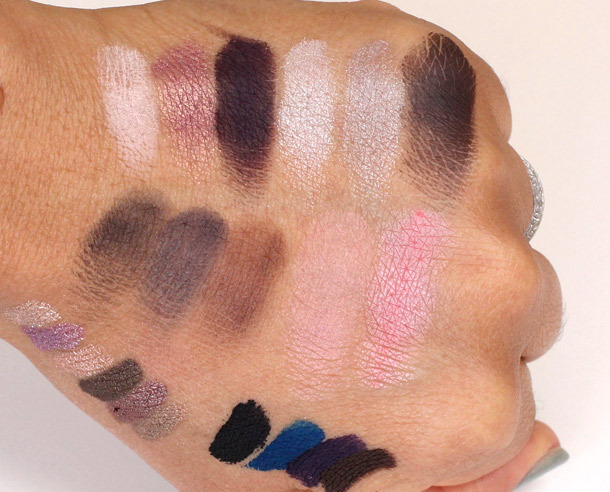 I barely had to run my finger across the pans for the vivid color in the swatches down below. 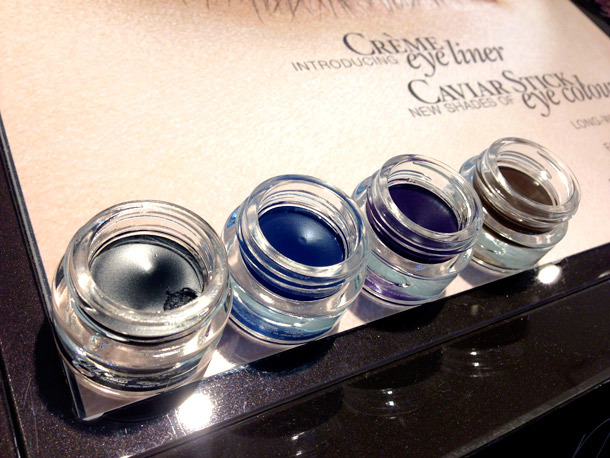 …and four potted Cream Eye Liners, which go for $22 each. 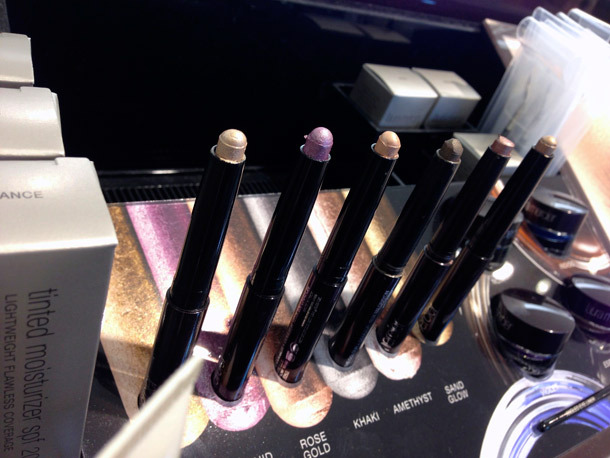 I’m all over those Caviar Sticks, especially Khaki, Amethyst and Sand Glow. Khaki is a grayish khaki green, Amethyst’s a purplish taupe with golden dreams, and Sand Glow glows like a buttery, golden tan, ah…. All of them seem so totally Laura to me, like colors I could happily wear forever (or darned near) without getting bored. Seems like Laura is showing lots of love this spring for purples, taupes and browns on the eyes. I like. How about you? 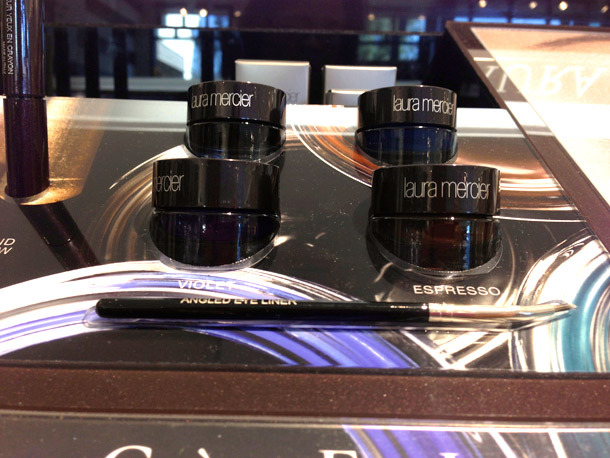 I am madly in love with Laura Mercier’s collection thanks to you :). I bought the African Violet eyeshadow as a single and I love it. 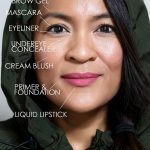 It really complements my green/hazel eyes and pairs great with MAC Mulch (Woodwinked would also work well with it, I think). 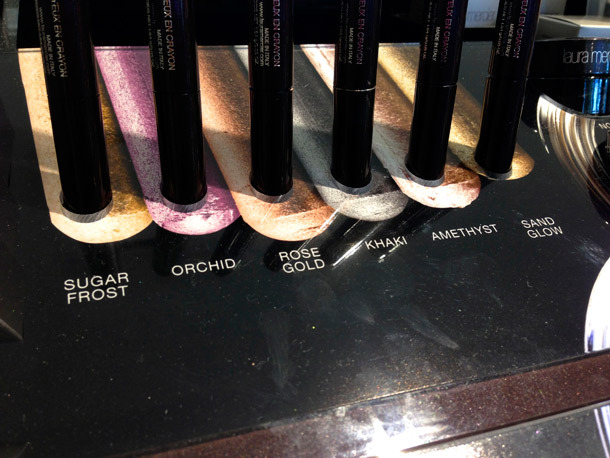 As for the Caviar Cream sticks, I think Rose Gold, Khaki, and Amethyst are calling my name. 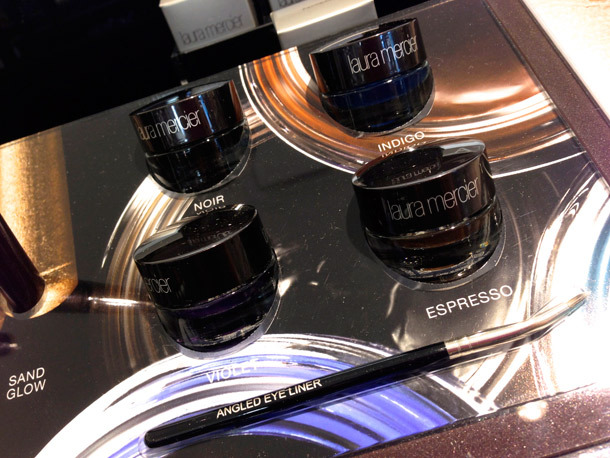 I love how Laura has neutral stuff with a twist – Stormy Grey and Black Violet are my all time favorite liners now. I swear, everytime I say,”this one last palette”!!!! Here comes another one I ‘need’! The creme liners. OH MY! 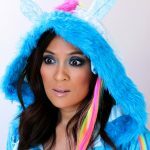 How vibrant are the Indigo and Violet shades? I likey. 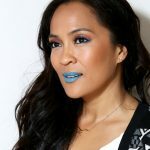 The caviar sticks look really pretty and I love how vibrant the blue liner is. Very cute! 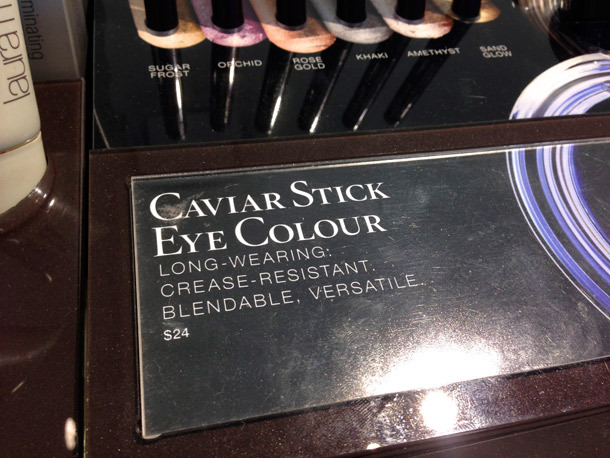 Can’t wait to see the Caviar sticks, especially Rosegold! I am such a fan of African Violet. 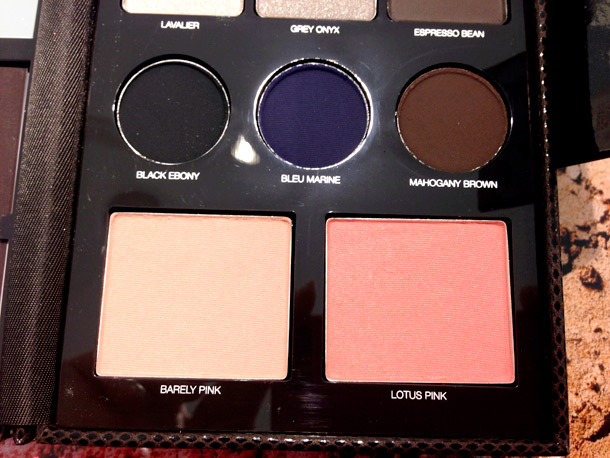 I just purchased the Artist’s Palette, mainly because AF is in it with so many other shades that are deceptively unique. 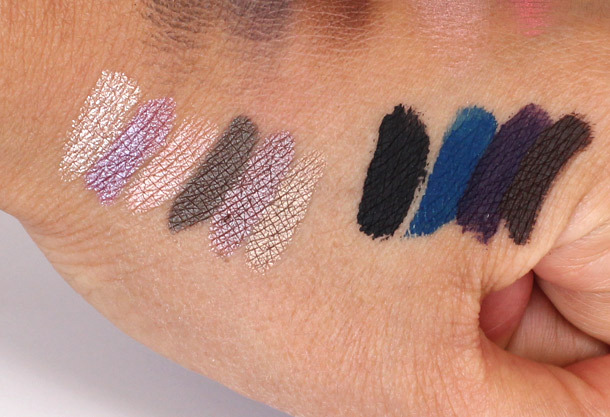 And the creme liners you swatched, SO vivid! Rae // theNotice recently posted … Adele at the 70th annual Golden Globes: not Ellie Goulding; still pretty awesome. 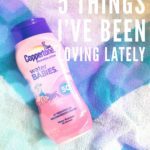 I am so excited about the cream liners! I’ve been hoping for new releases of cream liners. You’re right, the colors look pretty standard. The violet seems pretty but I already have way too many purples. 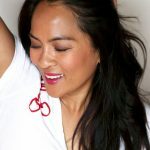 I hope Laura Mercier comes out with more colors soon! If she has to do matte, then a dark hunter green might be nice. New Caviar Sticks? Awesome! The Rose gold shade looks really lovely 🙂 Also loving the look of Indigo Creme Liner. 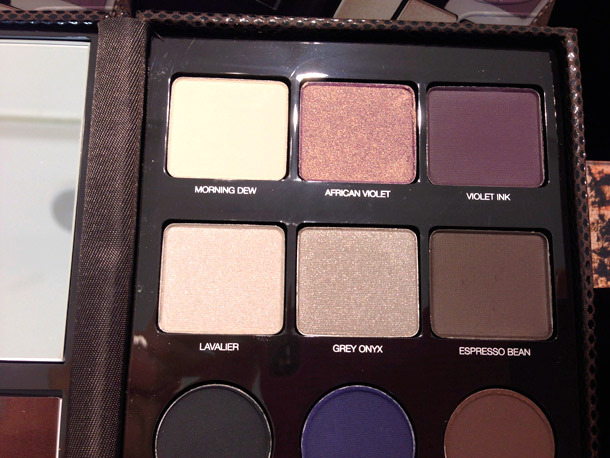 On a sidenote, even though I don’t own any of Laura Mercier palettes/color portfolios, LM seem to put African Violet on every palette, do they? The palette looks insane, and I need to try one of those Caviar sticks ASAP! It will be tough choosing between Khaki, Amethyst and Sand Glow! Lavalier, Grey Onyx are really pretty shades. Don’t get me wrong–the palette is very, very pretty, but isn’t it almost identical to the last spring palette she put out? Or maybe it was more recent than that…anyway, those liners look really nice. Love the blue! I totally need African Violet based on that photo! Ooooh! love love and love! 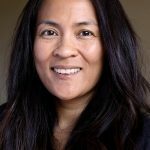 Laura M has done it again! 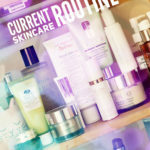 I am loving this stuff- any of it Sephora exclusive? 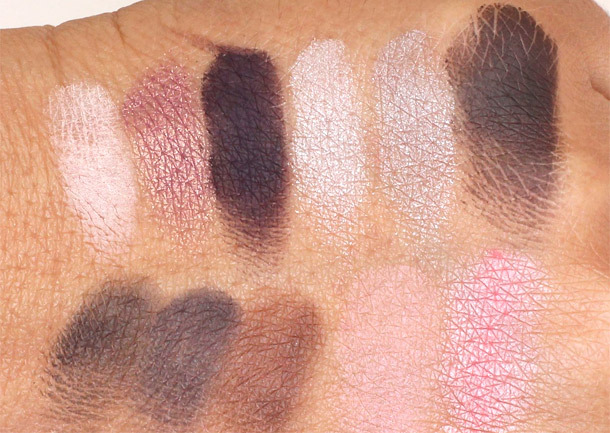 I am guessing the palette will be… I think I will need Rosegold and Khaki Caviar sticks. Maybe the amethyst, too. Sand Glow is gorgeous- how does it compare to Benefit Birthday Suit creaseless Cream shadow? Oooooh, Karen! For the past few years, your posts about Laura Mervier’s Spring collections ALWAYS tempt me. 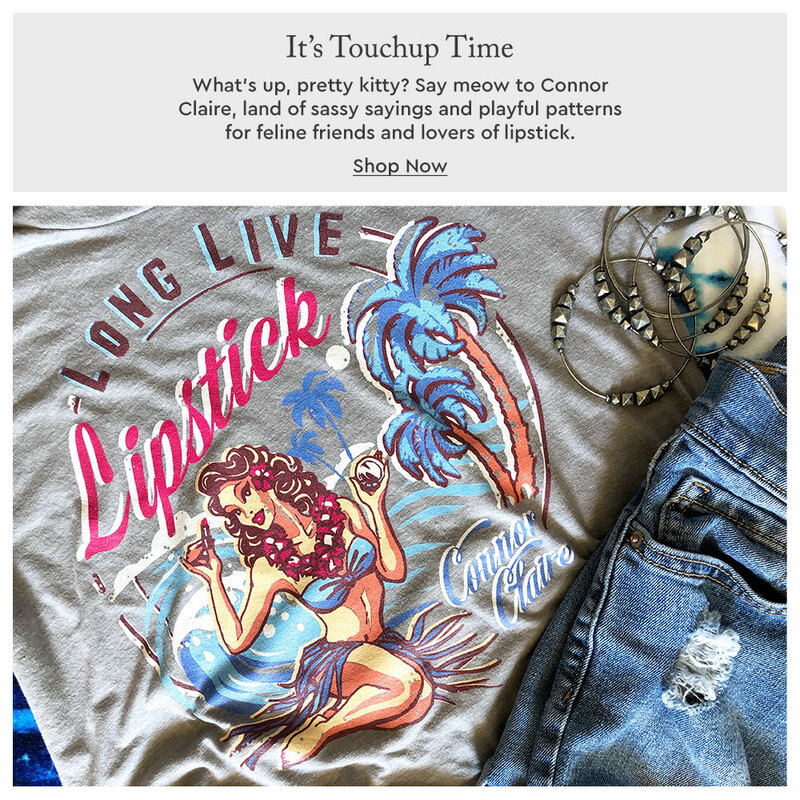 I’ve had to withhold the past few collections but this one is really calling my name! are the cake liners powder liners? I would buy this set ina heartbeat~! 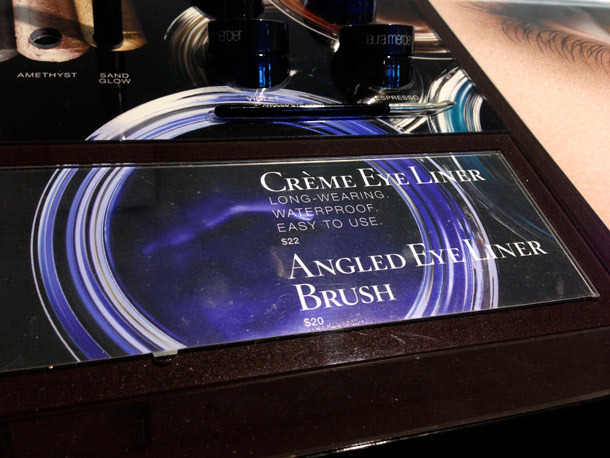 =o That Indigo creme eyeliner! African Violet makes me want that palette, I really have too many palettes with similar shades but it’s hard to come by a nice pink/purple shade that isn’t a glittery mess. I do love that African Violet! 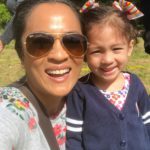 Before reading this blog, I never wanted palette’s before! Now I want ALL of them! 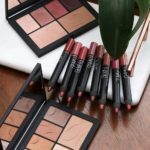 Haha palettes are addictive, you get a nice amount of different shades,products and colors you may have never thought of trying and usually at the price of one or two individual products. They’re also great for travel!